Saturday, July 23rd, 2016 at Estadio Maracana, Panama City, Panama, the showdown between Panama Raptors F.C., the 2015 reigning champions of the Panama Major Football League (PMFL), took place against the historic 12 time champions, Panama Saints. The game was aired live on the popular Panama channel CableOndaSports COS/2. Last year Panama Saints had their 2013 & 2014 PMFL Championship winning streak snuffed out of them in the playoffs, but are now once again back on top with their 13th win since the team was formed in 1990. This PMFL Championship final score was the lowest ever recorded with the Panama Saints obtaining the only touchdown of the game. Veteran player RB Tomas Altamirano #2, scored during the 2nd quarter with a run in the red zone from 3rd. An extra point scored by K Rodolfo Sabonge #7 left the Panama Raptors F.C. with the ill-fated score of 7-0. 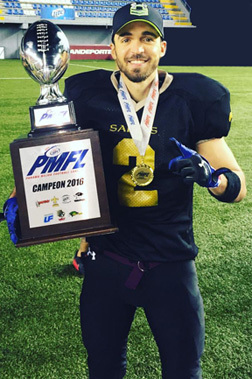 Altamirano plays in both Contact and Flag leagues making football a year round endeavor. He currently is also on the National Flag Team of Panama. Interestingly, he is not the only player who participates between the two forms of football, as two of his PMFL Championship teammates also play on Flag teams. Two standout Panama Saints players who performed well on defense were LB Fausto Campagna #41 and SS Juan Pablo Cuevas #18. Well deserved recognition goes to the skilled coaching staff of the Panama Saints: (Photo L to R) Guillermo Martinez - Defensive Assistant Coach, Horacio Perez - Head Coach & Defensive Coach, Rene Reyna - Offensive Coach and Gerardo Garrudo - Offensive Assistant Coach. Founding president of the PMFL and Panama Saints DL #56, Ivan ‘Moto’ Paz is widely known for his unwavering dedication to the development of the sport in Panama. Before the PMFL was inaugurated in 2011 it was known as the contact open league 18+ for many years. Without the dust even settling from their victorious win, the Panama Saints have already tentatively scheduled to participate in a champions vs. champions game, titled, ‘International American Football Cup, Palmares 2017’ against the 2016 1st Division championship team of Costa Rica, Bulldogs F.A. The highly anticipated game will take place during January at the renowned annual Palmares Festival. Palmares, a rural city approximately 54 kilometers from the capital of San José becomes a beacon for various entertainment events during the festival. The players embarked on a several month long trek towards the 2016 PMFL Championship starting with the annual Combine last January 24th & 25th that accepted tryouts from curious new prospects of the sport. A total of 170 Panamanians registered for the 2016 PMFL Combine eager to showcase their athletic skills. After deliberation, only 90 of the 170 hopefuls were drafted into the PMFL by way of public announcement at a press conference held on February 12th, 2016. The new players were disbursed to the 7 teams: Los Diablos, Colon Eagles, USMA Frailes, Halcones PTY, Panama Raptors F.C., Panama Saints, Club Wolfpack Panama all under the banner of the PMFL.